Chancellor Dan Rahn, M.D., left, and his wife, Lana, right, react as Natalie DeHart and Leanne Lefler unveil a painting for the Rahns. 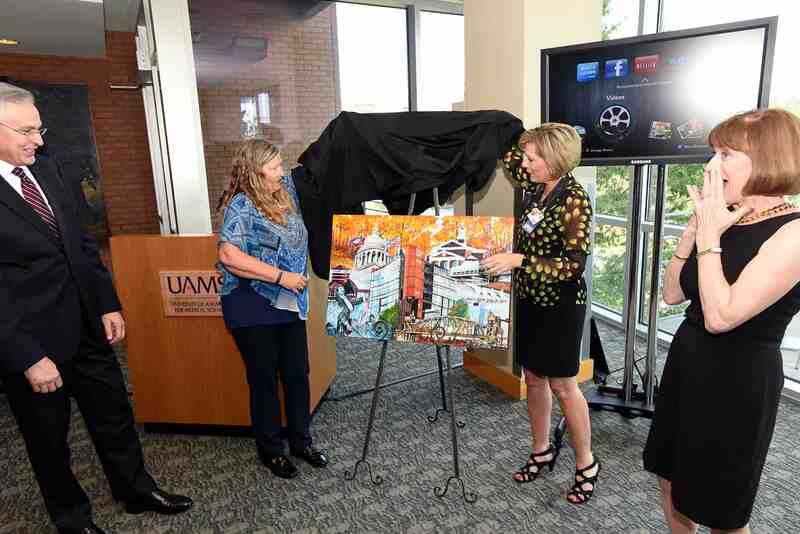 The painting was given as a gift from the UAMS House of Delegates and the Academic Senate and features a building that was officially named in honor of Rahn earlier in the day. July 11, 2017 | July 11, 2017 | University of Arkansas for Medical Sciences (UAMS) Chancellor Dan Rahn, M.D., was honored today when University of Arkansas System officials dedicated an education building on the north side of campus as the Daniel W. Rahn Interprofessional Education Building. “Dr. Rahn has been a champion of interprofessional education, and I really can’t think of a more fitting tribute,” said Donald Bobbitt, Ph.D., University of Arkansas System president. Arkansas Gov. Asa Hutchinson also spoke at the dedication ceremony, held on the top level of a nearby parking deck from which the unveiling of the new lettering on the building was visible. 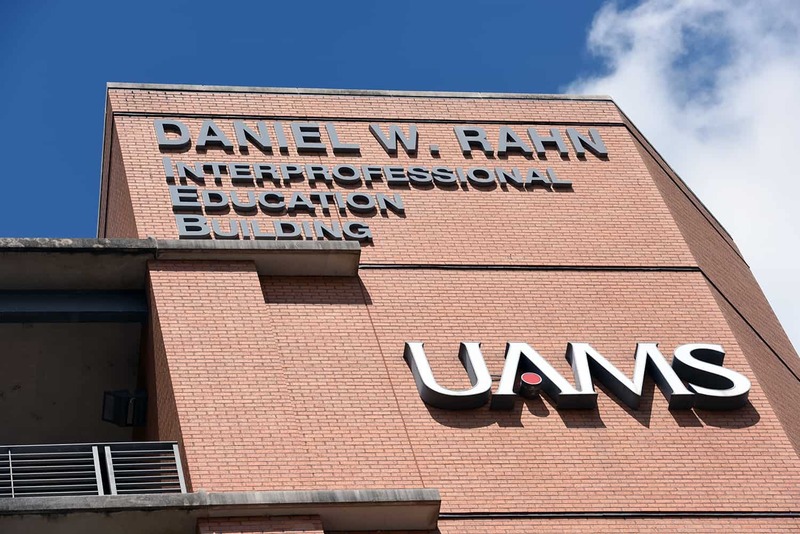 The building that houses the College of Nursing, the College of Pharmacy, the Fay W. Boozman College of Public Health and part of the College of Medicine has been named the Daniel W. Rahn Interprofessional Education Building. Rahn is retiring July 31 after serving as chancellor since 2009. The University of Arkansas Board of Trustees approved the naming at its meeting in May, and members Morril Harriman and Mark Waldrip were present for the dedication event. Students, faculty, staff and UAMS supporters also attended. Interprofessional education is when students from two or more professions learn from, about and with one another to improve health outcomes. It is important for preparing students to provide care in a collaborative team environment. From left, Donald Bobbitt, Ph.D., University of Arkansas System president; and Arkansas Gov. 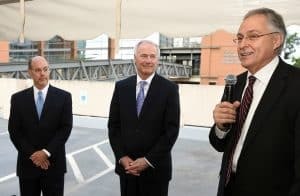 Asa Hutchinson, who both spoke at the event, listen as Rahn speaks after the unveiling of the new lettering on the building. After the unveiling, Rahn addressed the crowd, “UAMS really is a great institution, and I believe everyone knows that it is unsurpassed in its importance for the people of Arkansas, both today and in the future, and having my name attached to this institution is certainly one of the greatest honors of my life,” Rahn said. The celebration continued with a reception inside the atrium of the building, which houses the College of Nursing, the College of Pharmacy, the Fay W. Boozman College of Public Health and part of the College of Medicine. It was built in 2003. Natalie DeHart, chair of the UAMS House of Delegates, and Leanne Lefler, chair of the Academic Senate, presented Rahn and his wife, Lana, a painting by Arkansas artist Rex Deloney, who is an art instructor and chairman of the Fine Arts Department at Central High School. Lana Rahn began the UAMS Arts Council in 2011 and played a significant role in bringing the arts to UAMS to comfort patients, families and employees. In addition to honoring Rahn with the building dedication, the board has awarded him the ranks of chancellor emeritus and emeritus professor of rheumatology and immunology. 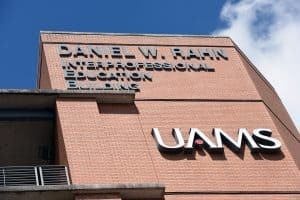 Also, the UAMS Foundation Fund Board and chancellor’s cabinet has established in Rahn’s name an endowment fund to support interprofessional education. More than $300,000 has been raised so far by members of the board and cabinet. Rahn announced in September 2016 his intent to retire, and the search for his successor is ongoing. Stephanie Gardner, Pharm.D., Ed.D., senior vice chancellor for academic affairs and provost, has been named interim chancellor. Site visits for the two finalists – A.Wesley Burks, M.D. ; and Danny O. Jacobs, M.D. – are scheduled for late July. For details, visit web.uams.edu/chancellorsearch. Rahn came to Arkansas from the Medical College of Georgia in Augusta, where he served as president for eight years and as senior vice chancellor for health and medical programs for the University System of Georgia. During his time at UAMS, he overcame an inherited $48 million budget deficit and led a university-wide initiative to improve efficiencies, cost effectiveness and performance, saving more than $100 million. He has overseen the reorganization of clinical programs into service lines focused on providing care centered on patients and families. Educational degree programs at UAMS and student numbers have grown significantly under Rahn’s leadership, especially with the addition of the Northwest Regional Campus in Fayetteville. Today UAMS has 75 degree and certificate programs and educates the majority of the state’s physicians, pharmacists, nurses and other health care professionals. Other key highlights from Rahn’s tenure include the designation of UAMS as the state’s only adult Level One Trauma Center, the growth of telemedicine programs across the state, the growth of primary care and geriatric programs operated through UAMS’ regional campuses and partnerships with other providers, and the addition of educational programs including a doctorate of nursing practice, doctorate in pharmaceutical sciences, physician assistant and physical therapy degree programs. He has championed underserved populations, made inroads in improving oral health in Arkansas, expanded UAMS’ presence and strengthened partnerships statewide. A native of Stroudsburg, Pennsylvania, Rahn is a graduate of Yale University and the Yale University School of Medicine, where he later began his professional career as director of the Lyme Disease Program, director of clinical training in rheumatology and director of faculty practice for the Department of Internal Medicine.